Hummer is one of the few brands reporting strong sales results in Russia. Few automakers have been protected from the massive decline in Russia car sales. Toyota Motor Corp., Ford Motor Co. and Hyundai Motor Co. all suffered declines of more than 70 percent year on year in July. Only General Motors Co. SUV subsidiary Hummer and Chinese automaker Geely reported sales increase in Russia last month. 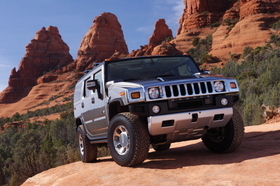 Hummers sales were up 59 percent to 96 units compared with July 2008. Geelys sales rose 170 percent in the month to 987, according to data from the Association of European Businesses. Leading global automotive companies have spent the last few years expanding aggressively into Russia. Companies such as Toyota, GM and Volkswagen recently opened plants in the country as they expected Russia to pass Germany to become Europe's largest market in 2009. While Russia is declining, other large emerging markets are growing. India saw demand for cars increase in July for the sixth month in a row, China saw car sales surge 70.5 percent from a year earlier while Brazilian motorists bought more new cars in June than any previous month in history, encouraged by a suspension of sales taxes.